If you have information, photographs or documents relevant to this website, we would be pleased to hear from you. If you wish to ontact a specific Branch Official, please scroll down this page for contact details. Please help us by NOT asking us to trace individual soldiers for you. Lincoln Branch of this Association do not have the resources to help in this way. But please DO read on - further advice can be found on this page. The Minutes of Lincoln Branch Meetings can now be read on this web site. (1) For Officers or Soldiers whose regular or reserve service ended before 1921 - The National Archives (2) Officers or Soldiers whose regular or reserve service ended between 1921 and 1997 - Army Personnel Centre If the soldier served during the First World War, The National Archives website www.nationalarchives.gov.uk enables access to medal cards, which should give details of the medals awarded, the regiment or other unit/corps and the service number. If you are looking for information about the regiment's actions on a given day or during a given period of time. For 'War Diaries' see next section Information relating to the regiment’s general history is covered very well in 'The Poachers' by David Nalson. If you are seeking information relating to the First World War it is comprehensively covered by 'The History of the Lincolnshire Regiment' by Major-General Simpson. If you are looking for information that may be contained in the Regimental Archives. 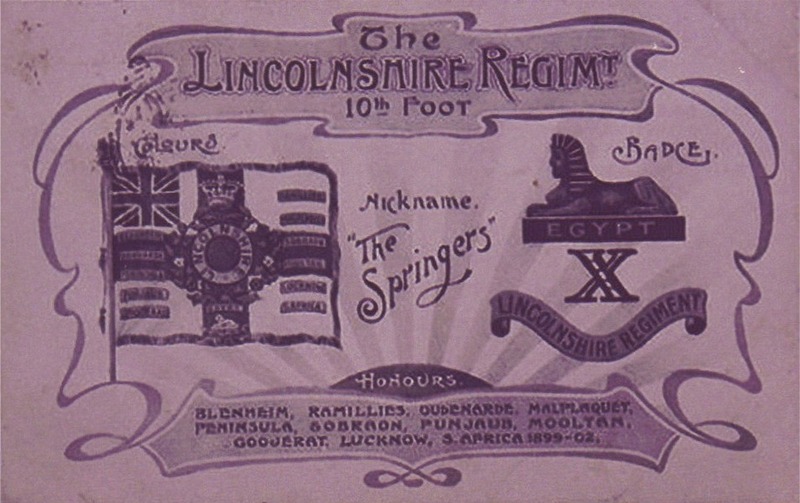 The Lincolnshire Regiment's archival collection is now held at Lincolnshire Archives. This collection includes the First World War Diaries, many photograph albums, newspaper cuttings, personal reports/diaries, letters and regimental history books as well as many other items. To access the collection or request research please contact Lincolnshire Archives. DISCLAIMER: The information hosted on this page may be subject to change in the future. Please do NOT direct requests for help with research to local Branch Officers. Lincoln Branch of this Association do not have the resources to help in this way. Instead, please follow the advice that you can find closer to the top of this page. Chairman: Derek Hocking. Tel: 01522 872917. Mobile 07783 484341. Email: derekandshani@yahoo.co.uk 340 Burton Road, Lincoln, LN1 3UP. Secretary: John Gooding. Tel: 01522 853495. Email: lincsregsec@gmail.com 49 Queensway, Skellingthorpe, Lincoln, LN6 4RJ. Treasurer: Ian Simpson. Tel: 01522 682721. 7 Redwing Close, Skellingthorpe, Lincoln, LN6 5SH. 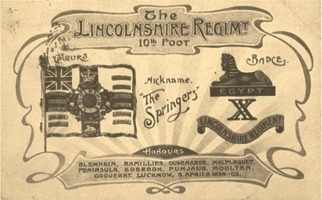 Lincoln Branch of the Royal Anglian & Royal Lincolnshire Regimental Association meet at Sobraon Barracks, Lincoln, on the third thursday of each month. The meeting timetable and other events are listed on the Events page of this website.